We are sorry, but we NO LONGER have any Shiba Inu at all. Rottweiler Litters "A", "B", "C", "D", "E", "F", "G", & "H"
Shiba Litter Whelped April 1998 - "Roadie" X "Killian"
Rottweiler Litter Whelped Oct 1998 - "Beef" X "Molly"
Shiba Litter Whelped Nov 1998 - "Riker" X "Killian"
Shiba Litter Whelped Nov 2000 - "Yankee" X "Tribble"
Rottweiler Litter Whelped Dec 2000 - "Bill" X "Xena"
Shiba Litter Whelped July 2003 - "Riker" X "Tribble"
Shiba Litter Whelped June 2004 - "Kage" X "Tribble"
Rottweiler Litter Whelped Sept 2005 - "Bill" X "Bea"
Shiba Litters Whelped July 2007 AND Feb 2008 - "Saku" X "Doodle"
Rottweiler Litter Whelped Feb 2008 - "Bill" X "Bea"
Our breeding goals are to produce dogs that are as close to our view of Rottweiler perfection as possible; Dogs that fit the AKC breed standard, have pedigrees that were given much thought, are highly intelligent, highly trainable, family safe, as well as having sound and healthy minds and bodies. In selecting dogs to use in our breeding program we look for dogs that are visually appealing and clearly identifiable as a Rottweiler, that are highly athletic and agile with structual soundness along with physical and mental health that are also highly intelligent, biddable, trainable, have a good work ethic, that are able to work through some adversity, are mentally stable and are safe in home and public. Additionally we feel that a proper Rottweiler should be able to compete in a working venue (s) that the individual dog shows an aptitude for (Obed, Rally, Herding, Tracking, Agility, Sch) with success, be a good citizen in public, be a good family member, scare off unwelcome intruders, not be so wired and crazed that they need to be kennel dogs nor so dull that you can't get them out of the house. They should be highly intelligent and easily trained. You should not have to beat your head against the wall while training. 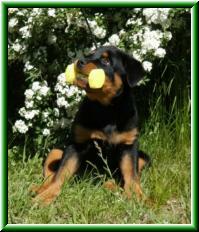 If this is not your view of a “Proper” Rottweiler, than one of our dogs is not for you! PLEASE NOTE: we ONLY sell puppies to the U.S. and Canada and we DO NOT ship puppies. We breed ONLY when we ourselves are ready for a new dog and as such, we do NOT have puppies regularly, actually we rarely have puppies these days. There may, and often is, many years between litters. We believe quality of pedigree and litter care is more important than quantity of puppies produced. If you decide that a Frontier dog is for you, you may have to wait until a litter is born. 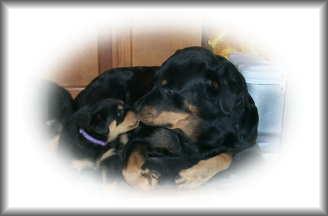 We usually have several deposits for upcoming litters before they are even conceived! Puppies are generally all spoken for before they are 5 weeks of age and often times sooner. We accept personal checks for deposits but final payment must be cash , money order or bank check ONLY. WE RESERVE THE RIGHT TO DECLINE A SALE TO ANY APPLICANT. 1) We require 2-3 references. 1 preferably from a veterinarian (if you have a pet already) and at least 1 from a friend or associate. Written and mailed regular mail to us. Applications are available upon request. 2) We require that YOU send us an e mail or letter describing your family, home, yard, town, dog experience and why you feel that this is the breed for you and why you want this dog. You must have the time to raise, train and socialize a puppy properly. The first year of your new pup's life should not be shared with a new human baby, frequent boarding kennel stays or 50+ hour a week work schedules. 3) You must read all the info on the breed from our web site AND you must read: "The Culture Clash" and "Mine" both by Jean Donaldson and "After you get your puppy" by Ian Dunbar. You must have done your homework on the breed and realize that a Rottweiler is not the dog for everyone and anyone (and why)! 4) You must agree to a possible home visit by us or someone acting on our behalf. Our puppies are well socialized to most normal household noises, car rides, and will have been exposed to many people as well. They are semi housebroken, crate trained, taught bite inhibition and started in clicker training and leash training with many knowing "let's go", "come", "sit", "outside", "kennel" and started on "down". For optimal physical and mental readiness we keep all puppies here until they are 10 weeks old. No pup is released to a new home younger than this age. The puppy will have been vaccinated once and wormed once or twice (and are microchipped also) and comes with a complete health record and recommended vaccination/titer schedule. The puppy also comes with a few days food, registration application, and a pedigree. The puppies are sold on written contracts to protect both the buyer and the puppy. Pups sold on Working prospect contracts are expected to train for and earn titles, or have a real world job AND be screened for health issues. If you are not commited to doing so, then one of our working prospects is not for you. It would be very rare (and require a long relationship with the buyer) for us to sell a working prospect as a breeding dog only with no titles or job planned. Because we are so very selective about allowing ONLY THE MOST perfect-in mind and body- Rottweilers to go on to be included in a breeding program, the vast majority of our pups go to Companion homes that fit their temperaments and personalities where they will be loved family members and where they may or may not compete and earn titles (BUT we encourage everyone to consider the basics: CGC certificate, BN and RN titles as possibilities), we do NOT refuse a companion home just because they have no interest in showing/trialing. We do not breed to feed our egos! Perfect placement for the individual pup is our primary goal. If you would like an application or would simply like more info please drop us an email. Please be sure to put "Rottweiler puppy information" in the subject line. We get a huge amount of junk email and any subject lines left blank or with a vague subject are deleted without opening.